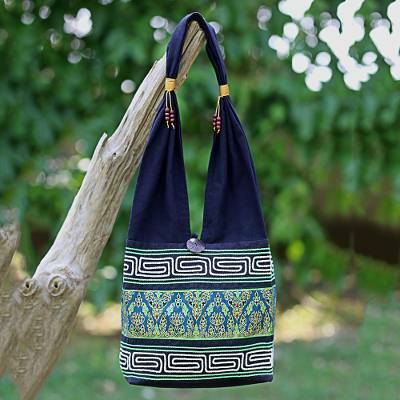 Cotton Blend Shoulder Bag Black Green Embroidered Thailand, "Spring Green Thai"
Spring green floral motifs are embroidered on a black shoulder bag in this piece by Thailand's Jiap Rojjana. Made from cotton blend fibers, the bag features polyester cords and wood beads on the strap. A coconut shell button opens to reveal a cotton lining in black with an interior zipper pocket. You can find cotton blend shoulder bag 'Spring Green Thai' by Jiap Rojjana in handbags categories such as Floral Handbags, Cotton Blend Handbags, Polyester Handbags, Wood Handbags, Coconut Shell Handbags and Shoulder Bags Handbags. Enjoy exploring these sections for other Novica treasures. "I love this purse. " I have shown this to many friends and everyone thinks it is beautiful. It is very well made.